HP has a reputation of producing budget laptops of acceptable quality. Judging by the HP 350 G1, the company is apparently still interested in retaining this status and even advancing it. This relatively new and pocket-friendly 350 G1 laptop is designed for handling tasks you need done at work and in your home without stress. HP 350 G1 flaunts a relatively slim profile at a thickness of just 23.1 millimetres and weighs 2.3 kg. The matte body is unsurprisingly made of plastic, except for the metallic palm rest. The case has a black finish, but the back of the lid and the palm rest features a silver finish. The laptop has two small maintenance hatches for the hard drive and working memory. HP 350 G1 uses a 15.6-inch, Samsung TN LED display with a resolution of 1366 x 768 pixels. The matte nature of this screen makes the laptop suitable for outdoor uses. HP 350 G1 uses a variety of Intel processors, including Core i3, Core i5 and Core i7 chips. The choice of processor influences the price to be paid for a unit. Graphics is handled by Enduro switchable graphics solution, which is made up of an Intel HD graphics processor and an AMD Radeon HD graphics processor with diverse uses. The HP 350 G1 laptop comes with 4GB of RAM, which can be upgraded up to 8GB. It is preinstalled with Windows 8 Professional (64-bit version) and a recovery DVD is also provided for installing Windows 8.1 (64-bit) Professional. The budget laptop has a hard drive with a speed of 5400 and an ample capacity of 500GB or more, which means you have enough space for as much music and movie files as you may desire. A powerful Li-Ion battery with a capacity of 40 WH is provided. The battery lasted for about five hours in test conducted. HP 350 G1 has three USB ports (one USB 2.0 and two USB 3.0), a card reader, one HMDI and Kensington Lock, amongst other connectivity interfaces. Networking options on the HP 350 G1 include Bluetooth 4.0 and Wi-Fi 802.11 b/g/n. Optical drive, HD webcam, stereo speakers and High-Definition Audio Controller are some of the other features of the laptop. 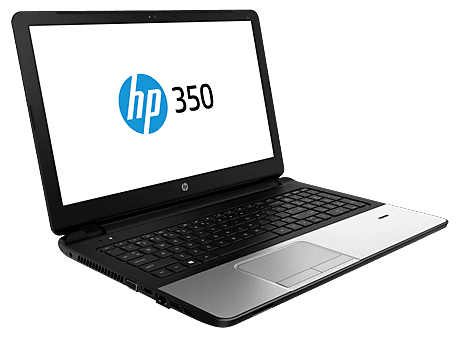 HP 350 G1 laptops are available in Nigeria. HP 255 G3 price in Nigeria starts at around N85,500, depending on your location and the configuration of the laptop.